A detail from Vincent Van Gogh’s A wheatfield, with cypresses, early September 1889. National Gallery, London. Bought, Courtauld Fund, 1923 (NG3861) © The National Gallery, London. Van Gogh and the Seasons, showing at the National Gallery of Victoria, is more than an opportunity for a geographically isolated Australian audience to view the works of one of the world’s best-known and beloved artists in the flesh. Our last major Van Gogh exhibition occurred one generation ago in 1993 at the NGV, moving on to Queensland in early 1994. It adopted a broad perspective on Van Gogh’s genius, placing him in the context of both his sources and his impact on the history of art. With 35 paintings and 13 drawings from 20 lenders, this new exhibition is not huge in scope and does not feature Van Gogh’s most iconic works. However, it is the largest collection of his work ever to travel to Australia and the first exhibition anywhere to focus so intensively on the seasonal theme. It is the fourteenth in the series of Melbourne Winter Masterpieces and brings a welcome surge of colour and movement to a damp and bleak Melbourne. Van Gogh’s total immersion in the natural world, both as the subject of his art and for its therapeutic effects, saw him observe, in minute detail, the everchanging moods and landscapes of the seasons, cyclical time through the rhythms of farming and human activity, and the qualities of light that changed with both the time of day and the time of year. 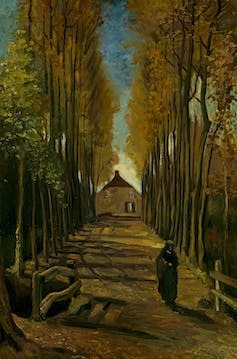 Vincent Van Gogh, Avenue of poplars in autumn, late October 1884 Nuenen, oil on canvas on wood panel 99.0 x 65.7 cm. Van Gogh (1853-1890) was the son of a Protestant clergyman of the Groningen school and exhibited fervent religious devotion in his mid-twenties. He rejected this, to some extent, in the 1880s, as he commenced his art practice in earnest. However, a Christian outlook remained central to a worldview that also bordered on the pagan, with all of the natural world infused with a divine presence. Van Gogh grew up imbued with notions of public service. In the family tradition, he studied to be a minister before undertaking preaching work in England, Holland and Belgium, often living almost as a mendicant. When these efforts came to nought, he turned to making art with the financial support of his younger brother, Theo. This was less a break with his former ambitions than a continuation of “Christ-like service” in a different guise, and re-connected him, through Theo, to the family’s commercial art business. Van Gogh’s hope, expressed repeatedly in his letters to Theo, was to share with others the profound healing to be found in nature and in colour. The seasonal cycle promises predictability within inevitable change, and the seeds of rebirth within each death. 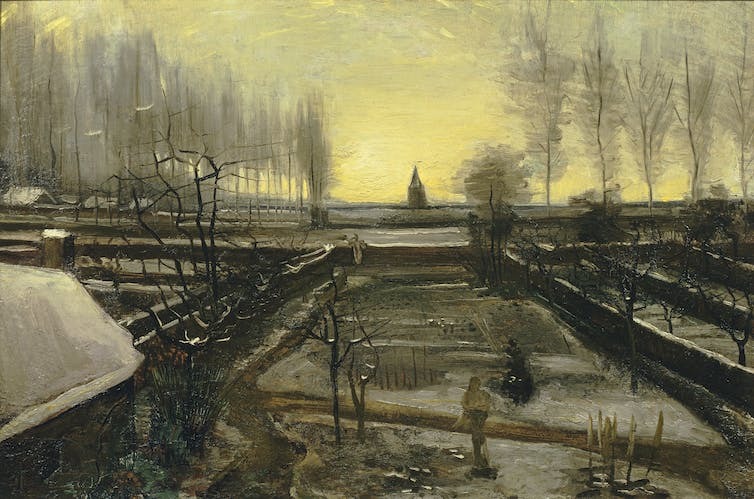 Van Gogh and the Seasons is curated by the former Head of Collections at the Van Gogh Museum, Sjraar van Heugten, with the assistance of the NGV’s Senior Curator of International Art, Dr Ted Gott. It adopts a focused approach, highlighting the pivotal seasonal theme of Van Gogh’s oeuvre through which the artist expressed the joys, disappointments, melancholia and bleakness of his own mental landscapes. The exhibition is carefully curated to play up its many strengths, while disguising some of its weaknesses. The rooms are laid out as a journey through the year, and through Van Gogh’s life as an artist. A beautifully shot, atmospheric video, narrated by David Stratton with David Wenham as the voice of Vincent, sets the stage, explaining the centrality of the seasons to Van Gogh’s work. The next two rooms explore his sources of inspiration in his personal print collection and his fascination with Japanese woodblock prints. As the originals of the latter are too delicate to travel, the display is pulled together from the NGV’s own collection and introduces the seasonal layout. 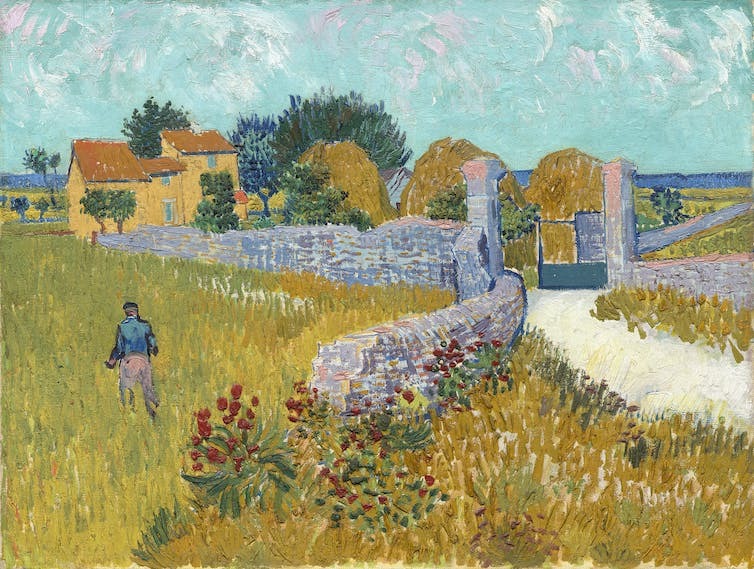 Vincent Van Gogh, Farmhouse in Provence, June 1888 Arles, oil on canvas 46.1 x 60.9 cm. The remainder of the exhibition is a stroll through Van Gogh’s seasons, each separated by a semi-transparent black screen in a manner reminiscent of traditional Japanese architecture. The metaphor of the journey is extended by placing almost all works on a wall of their own. This has the additional effect of making the exhibition seem larger and of downplaying the framing inconsistencies that would be distracting when hung together. The first of Van Gogh’s seasons – autumn, his favourite – is the season of the sower of seeds on the bare earth. This is a recurring motif in Van Gogh’s work that derives from European painting traditions, reflects his interest in the poor and honest toiling peasantry, and is also associated with the figure of Christ. It is a season for melancholy, burnt bronzes and dark autumnal shades, such as in Avenue of poplars in autumn (1884) and Autumn landscape at dusk (1885) in which a woman in mourning walks alone down an avenue of trees and long shadows. By 1888 Van Gogh was introducing colour into even his autumn landscapes, depicting the bustle of the grape harvest in Arles in vivid blues, greens, purples and yellows, with just a few touches of red. From the window of his asylum room in 1889, he watched the olive harvest and painted it about 30 times, thinking always of Christ in the garden at Gethsemane. Unlike his contemporaries Émile Bernard and Paul Gauguin, Van Gogh omitted the figure of Christ, leaving the viewer to discover divinity in the landscape itself. The bleakness of a snow-covered field in winter and an idle plough, alongside images of churchyards and funeral processions, speak of the harshness of existence and death, but also of the dormant seed beneath the snow, pregnant with the potential for germination in the spring. Vincent Van Gogh, The parsonage garden in the snow, January 1885 Nuenen, oil on canvas on wood panel 53.0 x 78.0 cm. Spring is the season of bulbs and blossoms, vivid greens, pinks and purples, lush growth and young green wheat. Grass spurts from nooks and crannies in gardens. Tree trunks fairly dance under clear blue skies. Summer is the farmer now turned reaper, golden wheat fields ready for harvest, and the sheaths gathered in under turquoise skies. In these spring and summer paintings from Van Gogh’s last frenzied months of creativity, his mastery of colour and brushstroke are most apparent. 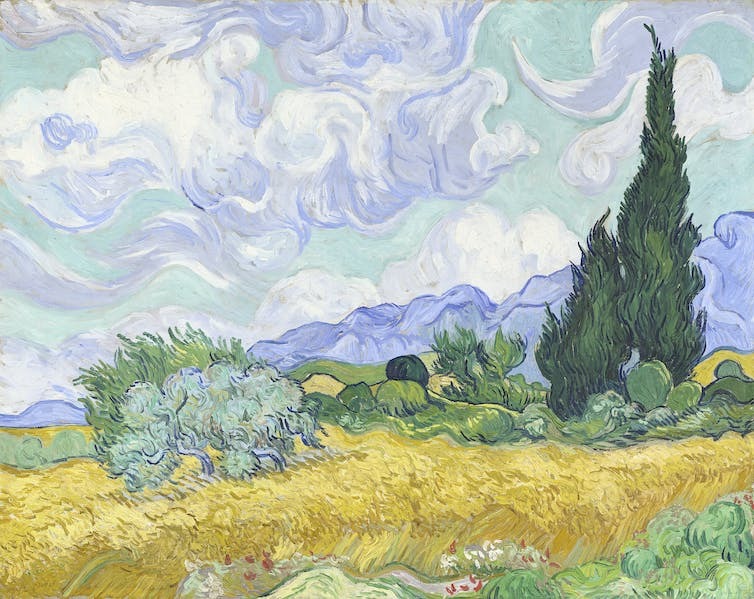 The exhibition culminates in the iconic image of A wheatfield, with cypresses (1889) which, in a coup for the NGV, was loaned by the National Gallery of London. It was in just such a wheatfield that Van Gogh shot himself, ending his own life at the age of 37. Van Gogh and the Seasons is a sensitively curated crowd pleaser that justifies the NGV’s recent ranking as the 19th most popular art gallery in the world. Van Gogh and the Seasons will be on display at NGV International, 180 St Kilda Road, Melbourne, Australia from 28 April – 9 July 2017 as part of the Melbourne Winter Masterpieces series.